Spinfuel 2014 eLiquid of the Year Awards! Today, we’re sitting down with A.J. Rasta from Rasta Vapor. It’s not too often we see an entire lineup of eliquids with a single over-arching theme. Spinfuel: A.J., can you tell me what sparked the idea of having a single theme for your business and eliquid lineup? Rasta: We wanted a theme that would stand out above the rest, and the “ Rasta” theme was definitely something that was not out there in the market yet. Spinfuel: Let’s get a little personal; how did you come to make the transition from smoking to vaping? Rasta: I woke up every day feeling beat down from the cigarettes and a friend of mine turned me on to V2’s. Aside from the obvious, the original V2’s just didn’t give the same satisfaction of a cigarette. It was definitely lacking in something, so I knew I had to find something better, something more satisfying. Spinfuel: And I have to ask, because many of our readers are probably wondering — I know I am — how does the theme to your liquids (Rasta, reggae, and, um… the elephant in the room that I hesitate to mention) tie into your lineup, as regards the selection of flavors? Rasta: Let’s just say we stay informed on where the future is headed, and when the time comes we wanted to be set up in a way to keep growing with the future, and the elephant in the room. Spinfuel: What kind of quality assurance standards and practices do you use when creating your eliquids? Rasta: We use only US made products. We prepare all of our liquids in a totally sterile, clean room. We have done a lot of research on all companies that we work with and believe they have “high quality” on the top of their list, as we do. Spinfuel: Any teasers for new flavors we might see in the future? Rasta: Definitely! Have quite a few we are vaping right now and will debut at the Tampa Vaping Convention February 21st and 22nd. Snozzberry and Maui Punch being some of the names. We will leave the mystery in what the actual flavors are. Spinfuel: Getting back to a more personal angle; what made you decide to launch your own line of eliquids? Rasta: Quality is hard to find out there. It became obvious very fast, that a lot of lines are all about quanitity and not quality. We knew we wanted only US high quality juice, and there just was not a lot of that on the market. Spinfuel: Sticking with the personal for just a moment longer — what’s your professional background? What do you bring to the creation of eliquids, qualification-wise? Rasta: On the technology side, I have an extensive background there, which helped in the creation of our colorful website. I am highly motivated when it comes to the creation of great flavors coming together. I am aggressive when it comes to research and weeding through the fine print to get to the bottom of top quality mixing of flavors. As well as the ability to spend countless hours mixing flavors until I find the perfect flavor matches. Spinfuel: You have an open mic on this one: Is there anything you’d like to say to our readers that we might have neglected to ask about? Rasta: The bottom line for Rasta Vapors is that we believe in QUALITY not QUANITY! Although our goal is quanity from the quality of our juices. Our prices are higher than some of the others out there, but our goals demanded that we use the highest quality ingredients out there and quality comes with a price. We stand by our product because we know wholeheartedly our product is of the highest quality. We don’t call it SuperDank for nothing! All original content is written and produced for our readers by the Spinfuel Staff. The writing staff includes Julia Hartley-Barnes, Keira Hartley-Barnes, Tom McBride, Jason Little, Melanie Hendrix, and Dave Foster. Spinfuel also publishes guest contributors on occasion. All original content is protected by US copyright laws. 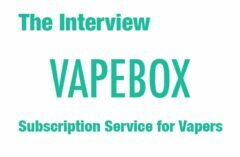 Vaping and How to Stay Healthy in 2019?